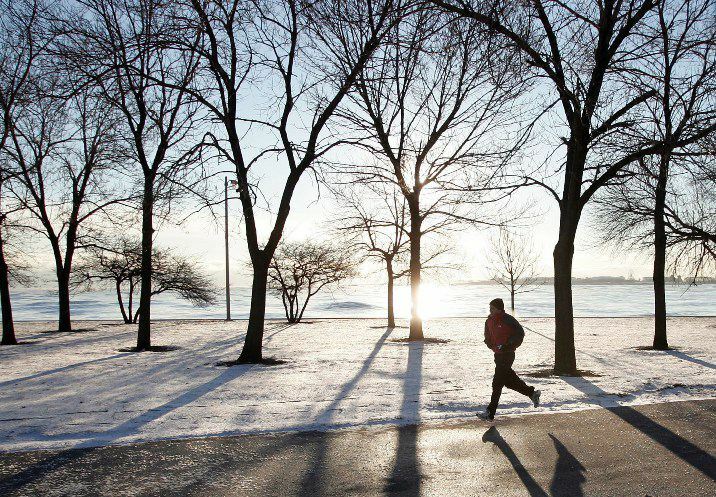 Winter weather means taking special precautions when you exercise outside. Cold exposure can make outdoor activity uncomfortable or even dangerous for anyone unprepared for extreme weather. It's important to be aware of the early warning signs and symptoms of cold exposure and how to prevent problems. Shivering is usually the first sign of dangerous cold exposure. As the body is trying to generate it's own heat you will develop uncontrolled muscle contraction. Shivering should be your first warning to seek shelter and warm up your core temperature. The two most dangerous conditions that can result from cold weather exposure include frostbite and hypothermia. Frostbite describes the freezing of superficial tissues of the face, ears, fingers and toes. To help a frostbite victim, get the person to a warm, dry place and remove constrictive clothing. Raise affected areas and apply warm, moist compresses to these areas. Do not rub frostbitten areas or apply direct heat. Hypothermia is a more severe response to cold exposure that is defined as a significant drop in body core temperature. At the first sign of hypothermia take the person to a dry, warm place or warm the victim with blankets, extra dry clothing or your own body heat. The first line of defense against cold exposure is dressing in layers that are appropriate for the conditions. Layers should include a combination of clothing (base, mid and outer) that help regulate your temperature and keep you warm and dry. Other factors that can negatively affect your ability to handle cold temperatures can include inadequate winter hydration and nutrition, dehydration, alcohol consumption, certain medications and health conditions such as diabetes and heart disease, which can significantly decrease a person's ability to exercise outdoors in the cold. To improve your comfort and safety while exercising in the cold, the American College of Sports Medicine recommends the following tips. Several thin layers are warmer than one heavy layer. Layers are also easier to add or remove and thus, better regulate your core temperature. The goal is to keep the body warm and minimize sweating and avoid shivering. Your head should be covered while exercising in the cold, because heat loss from the head and neck may be as much as 50 percent of the total heat being lost by your body. To warm the air before you breathe it, use a scarf or mask. Do this especially if breathing cold air causes angina (chest pain) or you are prone to upper respiratory problems. Wet, damp clothing, whether from perspiration or precipitation, significantly increases body-heat loss. Use a fabric that will wick perspiration away from the skin. Polypropylene, wool or other fabrics that wick moisture away from the skin and retain insulating properties keep the body warm when wet. Compare Prices on Socks. Dehydration affects your body's ability to regulate body heat and increases the risk of frostbite. Fluids, especially water, are as important in cold weather as in the heat. Avoid consuming alcohol or beverages containing caffeine, because these items are dehydrating. What you can during cold weather exercise can help you avoid serious cold-related issues. Plan ahead and pack the right snacks for sustained energy in the cold. Alcohol dilates blood vessels and increases heat loss so the odds of experiencing a hypothermic event increase. Alcohol can also impair judgment to the extent that you may not make the best or brightest decisions in a cold weather emergency. It's best to leave the alcohol behind when you head out into the cold. Extreme Cold: A Prevention Guide to Promote Your Personal Health and Safety, Centers for Disease Control and Prevention, http://www.bt.cdc.gov/disasters/winter/guide.asp. last accessed 12-09-2009.